Goparokko is a puzzle game similar to Destruct-O-Match II or Sutek's Tomb. You play as a masked Yurble who discovered strange colored stone blocks in Geraptiku. Your task is to arrange blocks of the same color to make them disappear. All you have to do is to move your mouse around the Goparokko board and click on a group of 4 blocks to rotate them clockwise. When they are arranged in a group of 2X2 or more blocks, they will disappear. Dynamite Block removes all the blocks of the same color from the board. Once the Layered Block is removed, a block of the small colors takes its place. When the Locked Block is among your selected blocks, you won't be able to move that group of blocks. Time Block will add more time to the water timer at the right of the screen when it is part of your combo. When part of your combo, the Bonus Block will multiply your points by the factor written on it. The Flashing Block can replace a block of any color in your combo. The game is offered in 3 difficulty levels: Easy, Medium and Hard. Every time you clear one block you earn, respectively, 4, 6 and 8 points. However, the game is much more challenging in hard mode because it has more color blocks and the timer goes faster, leaving you with less time to make combos. Avoid looking at the timer. It will only stress you out to see how much time you have left. The best is to look at the screen and locate as many combos as possible. To maximize your score, try to make 2X3 combos, or to clear two 2X2 combos at the time. Watch out for Locked Blocks! When they start to show up, clear them as quickly as possible or it could become harder to find combos in later levels. Combine Dynamite Blocks with Bonus Blocks to earn more points from all the blocks that will be cleared at once. Also, try to use the Dynamite Block when you have a fair amount of that color block on your board. To earn the avatar, play the game in Easy mode. While you might be tempted to go for Hard mode to earn points faster, it's easier to lose (and therefore stop earning points) on Hard mode. Play in easy mode and just keep making combinations. Eventually you will earn enough points for the avatar. Goparokko is a challenging puzzle game, but it gets easier after playing it a few times. 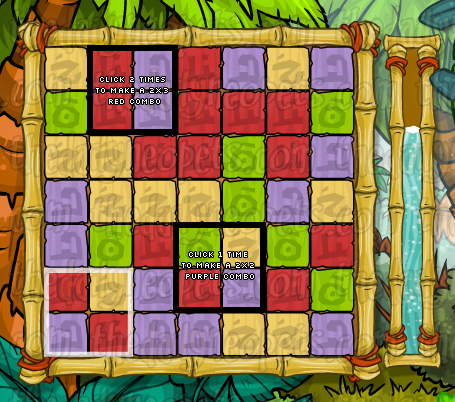 If you enjoy this game, you will definitely enjoys other Neopets' puzzle games such as Destruct-O-Match II or Sutek's Tomb. The Snowager is awake. He'll be sleeping in 5 hours, 52 minutes.